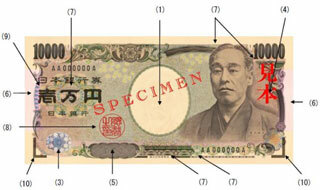 The 10000 yen note is a banknote of the Japanese Yen currency. The front design on the note features a portrait of Yukichi Fukuzawa, a Meiji era philosopher and the founder of Keio University. The design of the back shows a drawing of the Hoo (Fenghuang) in the Hall of the Phoenix, Byodo-in. 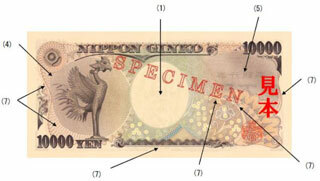 When the banknote is held up to the light, three vertical watermark bars (two bars for the 5000 yen note, one for the 1000 yen note) become visible. This feature is more difficult to reproduce with personal computers or color copiers than the traditional watermark. Like notes issued since December 1, 1993 (with serial numbers in brown), the new 10000 yen note has the words "NIPPON GINKO" ("Bank of Japan" in Japanese) printed in micro letters. Some of the micro letters are made even smaller on the new note than those on the current note. Also, micro letters of different sizes are included in the background design. Raised printing is used for some features of the new note. The ink on the 10000 yen note is raised higher than the ink on the current note.